On 21 December 2012, Mario Monti resigned as Prime Minister due to the withdrawal of coalition endorsement from the centre-right People of Freedom party. With waning support for the technocratic Monti Cabinet and the dissolution of Parliament, the Italian constitution required that elections be held within 70 days. Based on proportional representation and 26 electoral districts for the Chamber of Deputies and 20 regions for the Senate, Italy will elect 945 members into the lower and upper houses of parliament. As a result of the Electoral Law 270, introduced by then-Prime Minister Silvio Berlusconi in 2005, the coalition which wins a majority of votes within an individual region is guaranteed 55% of the seats that region is entitled to in the Senate. Similarly, as a result of ‘electoral prizes’, the coalition that obtains a majority of the votes on a national basis is automatically guaranteed an absolute majority of 340 seats (out of 630) in the Chamber of Deputies. The breakup of Italy’s technocratic coalition government in December 2012 led to general elections on the 24-25 February. The results of this poll are almost certain to have an effect on European markets, due to Italy’s precarious financial outlook. Without the technocratic cabinet of Mario Monti, markets and politicians remain wary about the future of the euro and of Italy as a whole. European issues have played an important role during the campaign, in part due to several parties’ positions on European politics. Silvio Berlusconi, who resigned as Italy’s prime minister in November 2011, is staging an comeback. With days to go ahead of the elections, polls showed that Berlusconi's coalition surged into second place, trailing the centre-left coalition by single digits. Such a comeback was made possible because Pier Luigi Bersani, leader of the centre-left Democratic Party, failed to inspire voters. If Bersani hadn't tailored the primary-election rules to win them, the Democratic Party would today be sailing to victory under the leadership of Matteo Renzi, the popular mayor of Florence, some political analysts say. But the party establishment saw Renzi as a threat to its power, and preferred an uncertain victory with Bersani to a certain one with Renzi. The campaign has witnessed a steep decline of regional separatist parties like Northern League and the rise of new political formations like the populist Five Star Movement, led by professional comedian Beppe Grillo, Civil Revolution, a radical-left party led by a judge; and Stop the Decline, a new free-market party led by Oscar Giannino. Running in fourth position in the polls, after Grillo's Five Star Movement is centrist technocrat coalition, Civic Choice, with Monti at the helm. As a result of austerity measures and new taxes, the Italian election campaign has been dominated by issues related to taxation, austerity reforms and the economy. The IMU property tax, introduced by Monti under the Salva Decreti (Save Decrete), remains highly unpopular amongst Italians as it forced homeowners to pay tax installments throughout 2012 on first and second properties. Monti’s new taxes and austerity reforms to counter Italy’s debt have raised concerns among voters who remain suspicious about public finances and governmental attempts at alleviating financial problems through fiscal hikes. His policies have nonetheless found strong support in Brussels. Olli Rehn, commissioner for European Economic Affairs, praised Monti for his fiscal legislation on property and consumer taxes like the VAT and IMU. In line with his austerity programme, Monti reconfirms the need for fiscal and monetary restructuring, but emphasises the fact that more cuts may not be necessary. As a ‘supplement’ to tax increases, he instead proposes that more funding is distributed at a communal level, as they are currently running on less than €15 billion. On austerity and the economy, Berlusconi proposes a cut in taxes, while promising that – if elected - his first decree as prime minister would be that of annulling Monti’s property tax on ‘primary households’. The leader of the People of Freedom has also promised various forms of tax rebates for pensioners and other groups, while blaming north European countries for Italy’s economic instability. Pier Luigi Bersani has also promised to scrap the property tax, but would want to replace it with another fiscal tax targeting persons with properties exceeding €1.2 million. This ‘super tax’ would alleviate further taxation from single home owners and middle class families. The EU was a much-discussed topic in the Italian campaign, as candidates differ radically on how to save the euro and which direction Italy should take on the Fiscal Compact and eurobonds. The Fiscal Compact, which is a stricter version of the previous Stability and Growth Pact, was signed on 2 March 2012 by all members of the European Union, except the United Kingdom and the Czech Republic. Monti has positioned himself as the Italian frontrunner for European reforms, guaranteeing a continuation of last year’s austerity measures. “The destiny,” Monti said, “of every country is no longer decided by its own borders but is determined and intertwined with the global systems in which it’s a member”. In other words, Brussels and the EU will continue playing an important role for Monti, both in terms of growth, as well as austerity measures and economic decision-making. On European solidarity, Monti notes that “Italy is a net contributor of the European budget meaning that it should ask Europeans to focus more on healthy public finances, further market integration and dynamism”. “An emphasis should also be placed on more European financial solidarity and more social and environmental inclusion” he said. With regards to eurobonds, Monti has emphasised the ample powers of the European Stability Mechanism as a solution to some of Europe’s and Italy’s problems. In general, he appears to be the most reliable candidate in terms of pushing through tough austerity reforms and further EU integration measures. The Democratic Party and the Left Ecology Freedom (Sinistra Ecologia Libertà) – both part of the center-left coalition - are divided when it comes to EU reforms and austerity. Nichi Vendola, leader of Left Ecology Freedom, notes that austerity has deteriorated the financial crisis, while stating that aspects of the Fiscal Compact should be considered undemocratic as they limit decision making powers dramatically. Although he holds a critical stance, he nonetheless reassures Brussels that “European federalism is the only way to get out of the crisis”. Bersani, similarly to his coalition partner, remains convinced that austerity measures are not healthy for the Italian economy in terms of growth. In tradition with Keynesian economic theory, spending, not fiscal constraint should be considered the best possible option for European countries in crisis. 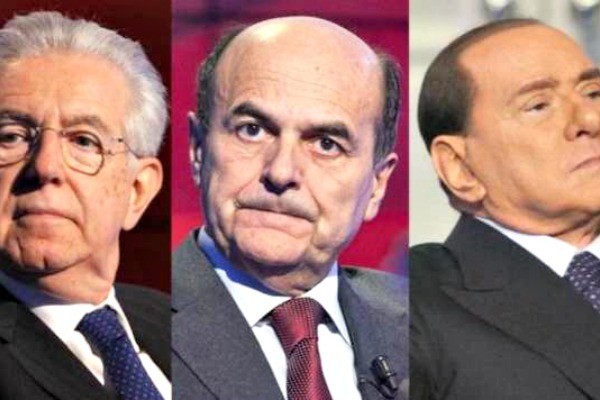 However, in contrast to Vendola, Bersani is not willing to go through serious treaty changes or re-examinations of reforms made by Monti in 2012. Berlusconi has strengthened his eurosceptical positions, while becoming increasingly critical of European measures of austerity, fiscal discipline and euro-integration. On the Fiscal Compact, which required countries to keep debt levels under 60%, Berlusconi has stated his opposition to some of the measures which went into force in January 2013. The leader of the centre-right believes the Fiscal Compact should be changed, even if this would require a new vote in Parliament. Instead of paying €50 billion annually for fiscal adjustments in line with the Fiscal Compact, Berlusconi would cut it to €15 billion. “We will keep cordial relations but with a firm opposition when Merkel or other colleagues from the north will ask us about things which aren’t in the interests of my country,” said Berlusconi. The most eurosceptic candidate in the Italian election is Grillo, leader of the Five Star Movement. Similarly to Berlusconi, Grillo notes that “with the return of the lovely old lira we could immediately devalue by 40% to 50% which wouldn’t solve all our problems, but it would make us much more competitive”. By saying so, he implies that one of the core solutions to overcome the financial crisis would be through Italy leaving the common European currency. “The decision to stay in the euro depends on Italian voters through a referendum, that’s my proposition – as long as Italians get to decide and not some oligarchic group,” said Grillo. On issues like the European Stability Mechanism and the Fiscal Compact, his party states that both should be considered an “immense swindle and the start of a new dictatorship, which must be shut down as soon as possible”. The Civil Revolution party also shares some of the Five Star Movement’s anti-European positions. According to their leader, Antonio Ingroia, “Italy should renegotiate the Fiscal Compact because we shouldn’t serve the interests of Europe’s banks and finances”. According to the various polls, between 12% and 20% of voters remain undecided in the final week before the elections. The risk is an inconclusive result that denies victory to any and leads to coalition deadlock, with the possibility of a hung parliament and a second vote. Under the Italian equal conditions law, it is prohibited to publish poll results during the final two weeks of an election campaign. In terms of probability the left-wing, in a coalition with Monti, is expected to win a comfortable majority in the Chamber of Deputies. The centre-right is more likely to produce a majority in the Senate because the voting age is 25. As the Italian age group between 18 and 25 traditionally votes to the left, this factor could play a vital role in the outcome of the election. The left-wing coalition would need to regionally win two out of three hotly disputed regions (Lombardy, Sicily and Veneto) to gain a majority in the Senate. Were Berlusconi to win the Senate, the left-wing coalition would be pushed into an alliance with Monti, which would lead to behind-the-scenes negotiations. Nonetheless – looking at the polls – a left-wing coalition with Monti looks like the most likely outcome on 24-25 February. With polls hinting at no clear winner, a hung Parliament is possible. This outcome would result in another round of elections in the upcoming months. This scenario depends on whether the left-wing coalition will be able to secure the 158 votes needed to avoid a hung Senate. Italian electoral law came into place on 21 December 2005, when Berlusconi was premier. Riddled with peculiarities, it’s believed to be radically different from any other European electoral law. Electoral ‘prizes’ are allocated to the party with a majority to ensure that a coalition is formed. The party that obtains a majority of votes on a national basis is automatically guaranteed an absolute majority of 340 seats (54%) in the Chamber of Deputies. In the Senate, the same mechanism applies on a regional basis. Any coalition is guaranteed 55% of the seats in any region where it wins a majority of votes. Italians vote in a proportional list-system, which means that they cast a vote for a party instead of a candidate. The parties draw up a list of candidates that are voted into Parliament, deciding in advance what the selection will look like. Minimum thresholds are different for coalitions and parties in Italy. A coalition is required a minimum of 10% to gain access to the Chamber of Deputies, while individual parties must fulfill the 4% minimum threshold to gain access to Parliament. In the Senate, the calculation is regional and parties must obtain 8%, while coalitions need 20%. Italian citizens residing abroad get to elect 12 members of the Chamber of Deputies and six senators. 8 November 2011: Berlusconi is forced to resign from the Presidency of the Council after the defection of three of his MPs led to the loss of his parliamentary majority. 16 November 2011: Monti and his technocratic government are appointed by Italian president Giorgio Napolitano. 4 December 2011: Monti pushes through an austerity plan called Salva Italia (Save Italy), totaling 63 billion € over 3 years. 20 January 2012: Cresci Italia (Grow Italy) plan is introduced, aimed at restoring growth through liberalisation and a simplification of administrative procedures. July 2012: a second austerity reform is approved, pertaining the labor markets. It does away with a number of unstable contracts (temporary contracts) while facilitating dismissal procedures. 9 December 2012: MPs in the People of Freedom boycott the confidence vote of Monti’s government and abstain during the 2012 budget vote in the Chamber of Deputites. 22 December 2012: The Italian parliament is dissolved after the adoption of the 2013 budget. In accordance to the Italian constitution, elections must be held within a 70-day period. 24-25 February 2013: Italian election. This is not completely correct, Beppe Grillo is just founder and testimonial of the movement, not a candidate. Italy can never be ruled, sugest it be divided into North, central and south. Each have its PM but they will work togather for a better Italy. There are great differances that no present PM can satisfy the whole of Italy.